In a week of trailer releases, a new bit of trailer footage has come out now for London Has Fallen the sequel to 2013’s Olympus Has Fallen. The trailer begins showing Mike Banning (Gerard Butler) and President Benjamin Asher (Aaron Eckhart) taking a jog near the White House before we cut to when several world leaders including President Asher all come to meet in London, England for the British Prime Minister’s funeral. All seems to quiet as we then see several areas in London decimated and the other world leaders taken out. All that’s left is the president whom a terrorist named Barkawi (Alon Aboutbol) wants to kill. It is a race against time as Barkawi continues to reak havoc all over the city killing people left and right and destroying landmarks. Banning and his team must do everything in their power to stop the mad man from not only killing the president but unleashing hell upon every major city in the world. The trailer as expected is heavy on the action and patriotism just like its original. Gerard Butler, Aaron Eckhart, Morgan Freeman, Alon Aboutbol, Angela Bassett, Robert Forster, Jackie Earle Haley and Melissa Leo all star in the action flick. 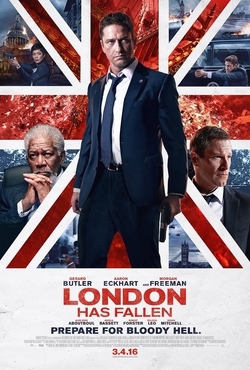 London has Fallen hits theaters March 4 2016. Scroll down to see the new trailer.